Flowers make everything happy and daisies have always seemed to be one of the happier flowers. 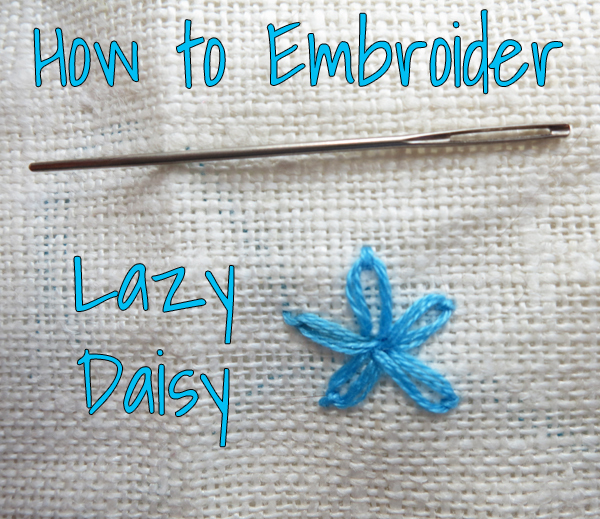 Lazy daisies are such a simple embroidery stitch (seriously deceptively easy. There’s a reason the word “lazy” is in their name!) but they can have a great impact to perk up, spring-ify, sweeten, and otherwise improve any garment you might want to stitch them onto! I stitched them all over one arm of my Bomber Jacket and it made we want to add daisies to everything I’m making these days! To embroider a lazy daisy: With your needle coming from below the fabric, bring the needle up through the fabric where you want the center of your daisy to be. Then put the needle back through the fabric from above to below, in the same place as you brought the needle up or right next to it. DO NOT pull tightly yet. Bring the needle from below through the fabric where you want the top of your petal to be. Make sure the needle is inside the loop of floss you made in the first step. Gently pull on the embroidery floss connected to the needle until the loop from step one tightens around the strand of floss from step two. Push the needle through the fabric from above to below, just above where you brought it up in step two and just above the loop of fabric that you created in step one. Gently tighten. This creates a little tack that keeps the petal loop in place. And that’s it. That’s all it takes. Keep repeating in a circle. You can have as many petals or as few as you want. The longer your petal is the skinnier it looks and the shorter it is the chubbier it looks. Play with petal length and number. You can even have multiple petal lengths and colors in the same daisy!